I’ve been buying Korean skin care products for about a year and a half now, and since they love to feature interesting ingredients, it took me some trial and error to identify what works for my skin. One such combination is Snail Slime Filtrate paired with Bee Venom. Yep, you read that right! There’s a particular indie Korean beauty brand that a lot of skincare bloggers rave about – Benton. Recently they got some major bad rep that deterred me from even trying their products [you can read more about the whole drama here and here, and google for more stories], but the curiosity got the better of me. 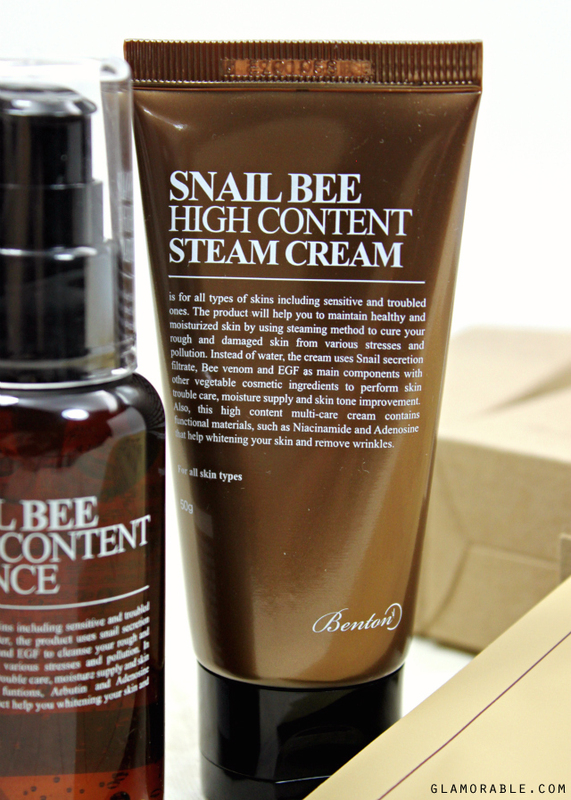 Memebox was selling many different value sets throughout the Holidays, and one of them was a crazy good deal on Benton Snail Bee bundle that included one Snail Bee High Content Essence, Snail Bee High Content Steam Cream, and Snail Bee High Content Mask Pack x10. 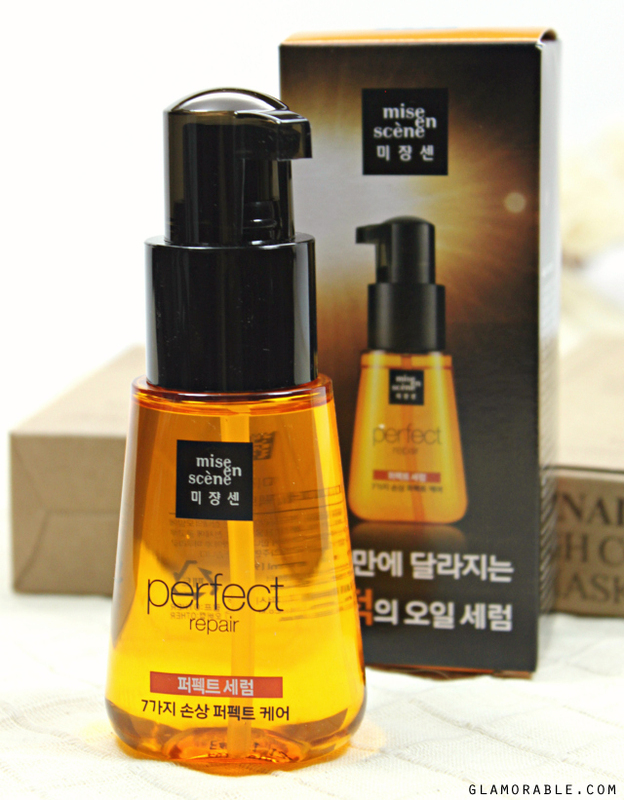 All orders also included a random free full-sized gift, and mine was Mise en Scene Perfect Repair Hair Serum leave-in treatment, which scored some beauty awards from Korean Cosmo magazine in 2014. That stuff is actually really good, I received it in my Memebox Global #15 in October, and barely put a dent in it, so I’ll probably give this one to my sis, who just started getting into hair care. High Content Essence [$18 ARV] is basically pre-serum product that I used right after cleansing and toning my skin. Its gel consistency melts into a liquid when it comes in contact with skin, and that makes it really easy to pat in for full absorption. This product is considered among some bloggers’ holiest of grails in skincare, and I can see why. For a while I’ve been using the essence alone, without the moisturizer or the masks, because I was scared that my skin might throw a fit, so I knew that if something changed, this essence would most likely be the culprit. Sorry to tell ya, ladies, but this stuff rocks! #sorrynotsorry It works wonders for old acne scars, even better than my fave Vitamin C, and really evened out my complexion. And most importantly, it works fast, because I started noticing the results after 3-4 days. And since this is a highly concentrated product, a little goes a long way – I needed two pumps to cover my entire face and neck. High Content Steam Cream [$15 ARV] is a thick concentrated moisturizer that can give those fancy creams a run for their money. Some people might wonder what on earth is a steam cream, so here’s an answer: it’s a method of fusing the ingredients together using a shot of hot steam, instead of traditional chemicals and wax emulsifiers. Not all chemicals are bad of course, but this way the company can use less filler ingredients, which is a good thing for our skin. I incorporated this moisturizer into my routine after several patch tests, because I was still freaked out about the whole contaminated batch story, and since my skin didn’t seem to react negatively, I started slapping it on my face daily. At first I didn’t see any actual improvements, but noted that it felt pleasant to apply and made my skin look smooth and soft to touch. Any good moisturizer would do that, though. But what surprised me was how quickly I got over my hormonal breakouts, because they practically disappeared within a few days, while usually I’m stuck with them for a week or two at least, and that’s considering that I’m using products designed to combat acne. I did some research, and discovered that it’s the bee venom that is making the miracles happen, because it makes your body think you’ve just been stung so it increases collagen production and speeds up the healing process. For the record, neither this cream, nor any other Snail Bee products, sting my skin. For the curious, here’s a link to the study that proves the effectiveness of bee venom for skin healing. High Content Mask Pack [$2 ARV] was probably the only “okay” product, which was unexpected, because I loved everything else. I just feel like it didn’t really add anything to the regimen, even though for someone who doesn’t own any Benton products this could be a nice boost of active ingredients. My skin always felt softer and better moisturized after I used essence + steam cream, and this sheet mask just couldn’t trump that combo. However, it does a splendid job at instantly calming down any redness and flushed cheeks, so it could be a lifesaver for someone suffering from that issue on a regular basis. Since Benton is kind of a small indie brand their products can be hard to find. My three trusted sources are RoseRoseShop, W2Beauty and Memebox. At the time of this review, there’s a value set you can get from Memebox for $50 that includes all three of these products, plus a lotion, a toner, and a cleanser. Click here to check it out. 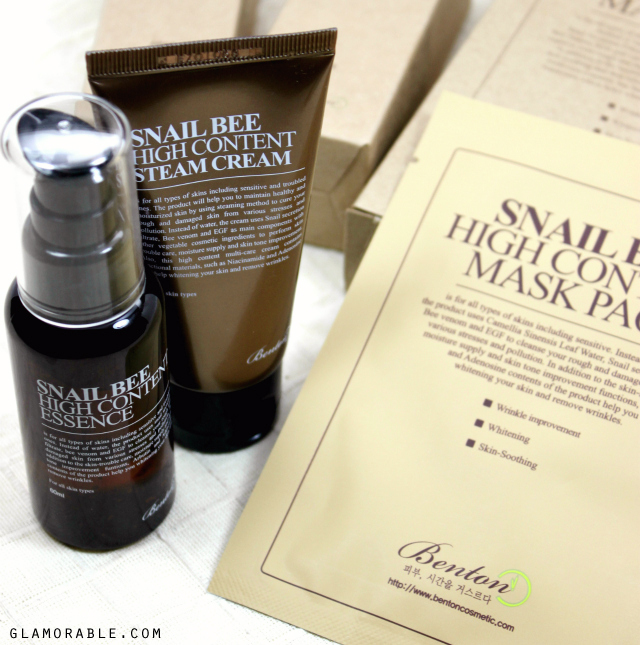 Have you tried any Benton products, or any skin care with snail slime or bee venom? 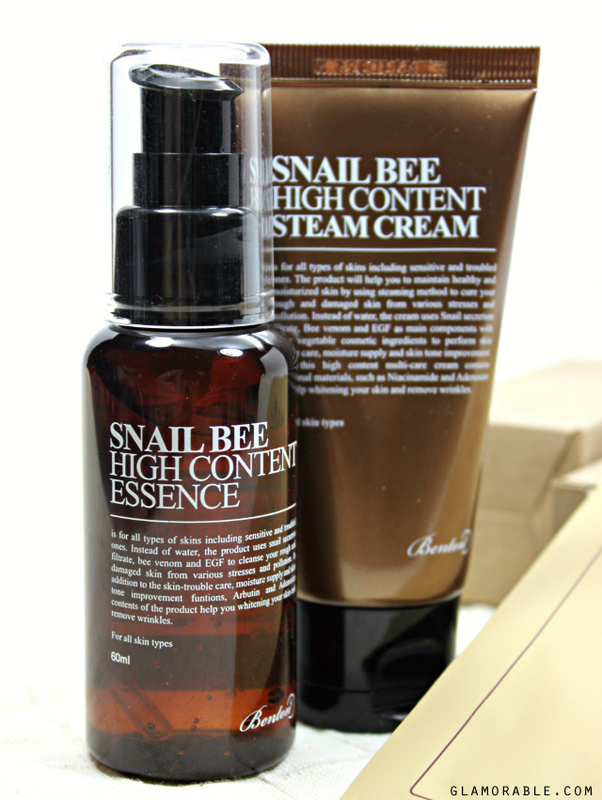 Snail Bee High Content Steam Cream – Snail Secretion Filtrate, Glycerin, Butylene Glycol, Cetyl Ethylhexanoate, Cetearyl Olivate, Sorbitan Olivate, Sodium Hyaluronate, Niacinamide, Stearic Acid, Behenyl Alcohol, Phytosqualene, Human Ogliopeptide-1, Bee Venom, Arbutin, Adenosine, Helianthus Annus (Sunflower) Seed Oil, Carthamus Tinctorius (Safflower) Seed Oil, Argania Spinosa Kernal Oil, Glyceryl Stearate, Arginine, Carbomer, Urea, Tocopher Leaf Extract, Salix Alba (Willow Bark) Extract, Ulmus Campestris (Elm) Extract, Pentylene Glycol, Zanthoxylum Piperitum Fruit Extract, Pilsatilla Koreana Extract, Usnea Barbata (Lichen) Extract. 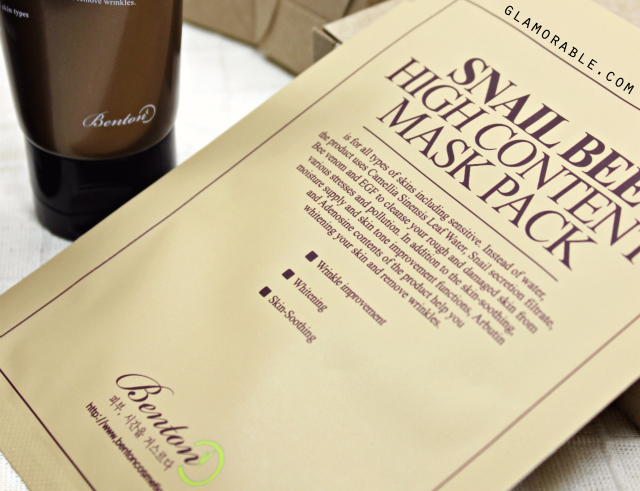 Snail Bee High Content Mask Pack – Camellia Sinensis Leaf Water, Snail Secretion Filtrate, Glycerin, Arbutin, Bee Venom, Human Oligopeptide-1, Plantago asiatica, Laminaria Digitata Extract, Diospyros Kaki Leaf Extract, Salix alba, Ulmus Campestris Bark Extract, Bacillus Ferment, Azelaic Acid, Althaea Rosea Flower Extract, Aloe Barbadensis Leaf Extract, Butylene Glycol, Beta-Glucan, Betaine, Xanthan Gum, Adenosine, Panthenol, Allantoin, Zanthoxylum Piperitum Fruit Extract, Usnea barbata, Pulsatilla Koreana Extract.